An important first step in repairing transformer oil leaks is leak detection. 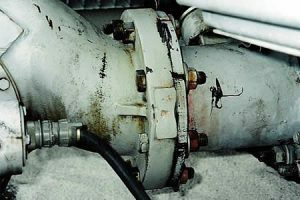 Figure 1 shows an 8-bolt connecting flange that appears to be leaking. However, it is difficult to determine if this component is actually leaking by visual observation. TDS personnel thoroughly clean the entire flange and then spray on TDS Oil Leak Detector. Figure 2 shows the 8 bolt flange after the detector has been applied to the flange connections. 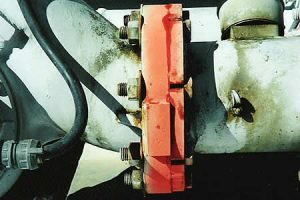 Oil has darkened the oil leak detector at the split line between the flanges, making it apparent that the flange gasket is leaking. TDS technicians are now able to concentrate their repair efforts on the actual leaks.